This post is likely to create a bit of controversy, as the chart Figure 1 shows that annual average residential electricity rates (cents/kWh) have kept up with inflation but not increased in real terms since 1996. 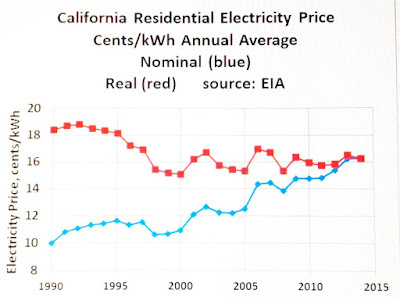 That is in stark contrast to the popular wisdom that electricity rates in California are out of control and skyrocketing due to shutting down nuclear plants (two of them in 2012) plus building expensive solar power and wind power. What is actually going on is more complex. The data in Figure 1 for state-wide annual average residential electricity prices are from US Energy Information Agency (EIA) data; while the inflation adjustment is from the US Consumer Price Index. The overall trend from 1990 at 10 cents to 2016 at 16 cents is a mere 2.5 percent compound annual growth rate. The argument that solar power and wind power have increased electricity rates is simply not credible, especially so when the very minor contribution of each is considered. Solar contributed only 6 percent of the entire grid load, and wind only 5 percent in 2015 per the California Independent System Operator, CAISO. Only five years earlier, the contribution of each was almost zero. Instead, the flat trend since 1996 is due to the steadily decreasing cost of natural gas, and the steadily increasing percentage of natural gas in the generation mix. Also, California has almost constantly replaced old, inefficient gas-fired plants with new, state-of-the-art Combined Cycle Gas Turbine plants with much greater efficiencies. A new CCGT plant uses approximately one-half the natural gas as an older steam plant, for the same power output. Therefore, the state is using much less gas per kWh generated, and the price of natural gas is much lower than in earlier years. (As an aside, we all have the oil and gas companies to thank, with their expert use of precision directional drilling (PDD) and hydraulic fracturing, for bringing great quantities of natural gas to market and depressing the gas prices). It is also a fact, however, that electricity rates are quite complicated in California. The state has a multiple tier system for power pricing based on the kWh used each month. The rate structures have changed over the years. The complex, and a bit un-fair system has caused a new and improved system to be developed by the California Public Utility Commission. The CPUC website for the improved system, and the process to develop that system, is at "California Residential Electric Rate Redesign" see link. 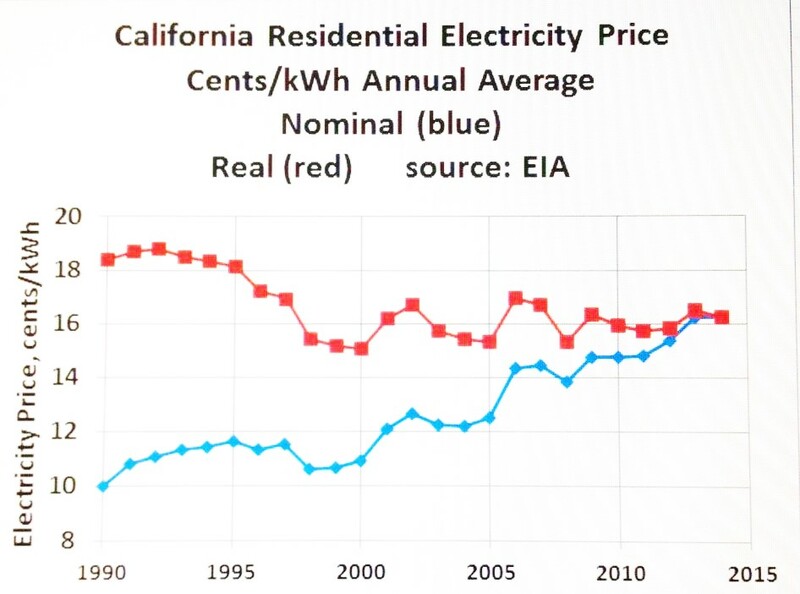 "In 2001 during the energy crisis, California passed legislation that froze volumetric electricity rates for a large portion of residential electricity usage (i.e., usage less than 130% of the baseline energy allowance or customer tiers 1 and 2). As utilities' costs increased over the years, because tiers 1 and 2 were frozen by law, increases could only be borne by those customers consuming above 130% of baseline levels (or customers in tiers 3 and 4). As a result, the difference between the lowest and highest tiers has become very large, and rates for tiers 3 and 4 to more than double those for tiers 1 and 2. In June 2012, the CPUC opened a Rulemaking to examine existing residential electric rate design, with the intention of ensuring that rates are both equitable and affordable for the foreseeable future, including for low-income customers. o Repeals rate increase limitations on energy usage tiers 1 and 2 (up to 130% of baseline) to allow rate reduction in tiers 3 and above. o Revises rates for low-income ratepayers, pursuant to the CARE program such that the aggregate discount is between 30% and 35% the bill. o Fixed charges may not increase by more than the consumer price index each year, starting on January 1, 2016.
o Allows for a reduction in the number of energy usage tiers in residential rates, but requires rates to have at least two tiers. o Prohibits mandatory or default time-of-use pricing before January 1, 2018.
o Requires the CPUC to develop a new net metering rate, which would become available on January 1, 2017." The state's average prices are keeping up with inflation, and no more. However, the disparity between low users (less than 130 percent of the baseline kWh per month) and those with greater consumption (more than 130 percent of baseline) led to rate reform. It is entirely possible for a low-use customer to be paying approximately 15 cents per kWh, while a residence with triple the baseline use would be paying 30 cents per kWh, or more. It is also clear from the chart in Figure 1, with the annual statewide average at 16 cents, solar power and wind power have purchase power agreements that are more than attractive to new investors. It is unfortunate that wind power in California has already been essentially built-out, as there are few remaining locations with advantageous wind. However, solar power is an entirely different story. The state has almost limitless square miles of otherwise un-used land with the famous California sun beating down daily. Recent installed costs for grid-scale solar power plants indicate approximately $2,000 per kW installed, and with the California sun bringing 26 percent annual output, a plant can be built and operated at a 10 percent return on investment with power purchase agreement of 10 to 11 cents per kWh. That is far, far less than what the utilities must pay for daytime power in the summer. That is a bit more than what the utilities pay for incremental power in the winter daytime, however the amount of power the solar plants produce in winter is also much smaller. On balance, the solar power plants are quite attractive at $2000 per kW. More reductions in installed costs are imminent, so that $1800 and even $1500 per kW are only about 4 to 5 years in the future. There are some grid operating implications, but those will be explored in future articles.